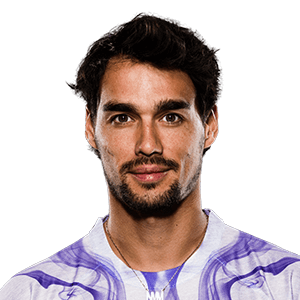 2004 - Fognini reached his first ITF semifinal at Uruguay 1 and completed his junior career with a combined ranking of No. 8, reaching the quarterfinals at Australian Open and Roland Garros. 2005 - He won his first ITF titled in Murcia and Bergamo and advanced to his first Challenger quarterfinal in Olbia. As a qualifier, he made his ATP debut in Palermo and lost to Elsner in three sets. 2006 - He reached a couple of Challenger quarter-finals in Napoli and Freudenstadt, and claimed his first ATP World Tour wins in Amersfoort (d. Guzmán, l. to Moyá) and Palermo (b. Marín, l. to Lapentti). 2007 - He began the season reaching the Challenger final in Santiago (l. to Vassallo Arguello). At Challenger level, during the summer he then lost two finals in San Remo (l. Aldi) and Furth (l. Luczak). He made his Grand Slam debut at Roland Garros and he led by two sets before losing to Monaco. He qualified in five ATP tournaments, reaching the third round in Kitzbuhel (l. to Seppi) and Montreal where he posted the biggest win of the season over No. 14 Murray before losing to Federer. He finished the year in Top 100 for the first time at No. 94. 2008 - After a first-round loss in five sets at Australian Open debut (l. to Russell), during Latin American swing he reached his first ATP quarter-final in Vi±a del Mar (l. to Ventura) and semifinal in Costa do Sauipe (l. to Almagro) in consecutive weeks. He celebrated his first Challenger title in Turin (d. Junqueira), followed by a second title in September in Genoa (d. Naso). Sidelined afterwards with left wrist injury, he returned in June and reached the semifinals in Warsaw (l. to Davydenko) and Umag (l. to Verdasco). He finished the season in Top 100 for the second straight year. 2009 - His best ATP World Tour result of the season came in Stuttgart as he reached the semifinals thanks to the biggest win of season over No. 11 Davydenko (l. to Hanescu). In September, he reached the quarter-finals in Bucharest (l. eventual winner Montanes). He captured a Challenger title on home soil in San Benedetto (d. Villagran) and finished the season as the No. 2 Italian behind No. 49 Seppi. 2010 - The No. 3 Italian (behind Starace and Seppi) finished in Top 60 for second straight year. His best ATP World Tour result was QF in Costa do Sauipe in February. In Grand Slam play, he collected a remarkable win over 13th seed Gaël Monfils at Roland Garros as he came back from two sets to love down in a match that spanned two days. At Wimbledon, he defeated Fernando Verdasco in the first round without dropping serve to claim his maiden Top 10 victory. He also earned three Challenger titles in Genoa, Napoli and Santiago. 2011 - Fognini reached his maiden Grand Slam quarter-final at Roland Garros after beating Denis Istomin, Stéphane Robert, Guillermo García-López and Albert Montañés in dramatic a match lasting 4 hours and 22 minutes. He was due to face No.2 Djokovic but doctors persuaded him to withdraw given it would be "dangerous" to play. Nonetheless, Fognini became the first Italian man in the French Open quarterfinals since 1995 and the first to reach that stage at a Grand Slam since 1998. In doubles, he also reached the Us Open doubles semifinals with Bolelli. He claimed two semifinals in Santiago and Umag and finished the season in Top 50 for the first time. 2012 - The No. 2 Italian (behind No. 23 Seppi) finished in Top 50 for the second straight year. He lost two ATP World Tour finals in Bucharest (l. to Simon) and St. Petersburg (l. to Klizan, the first Slovak to win a title since 2004). He came back to the third-round at Roland Garros for the third straight year (d. Troicki 8-6 in 5th, l. to Tsonga). On grass, he advanced to the quarter-finals in Eastbourne (l. to Roddick) and the second-round at Wimbledon (l. to Federer). At Us Open he celebrated his first third-round showing in the tournament: he out-aced Roddick but lost in four sets in the American last career win. 2013 - Fognini became the first Italian man to finish in Top 20 since Corrado Barazzutti was No. 10 in 1978. In Montecarlo, he reached his first career ATP Masters 1000 quarter-final and semifinal (d. No. 6 Berdych in the third-round, No. 9 Gasquet in the quarter-finals, l. to No. 1 Djokovic). Later, he captured back-to-back ATP World Tour titles in Stuttgart (d. Haas, d. Kohlschreiber in the final) and Hamburg (d. Haas, Almagro, Delbonis in the final). Then he lost the final in Umag (l. to Robredo). He advanced to quarter-finals or better in 11 tournaments and helped Italy to qualify for the first Davis Cup World Group quarterfinal in 15 years. 2014 - He finished in Top 20 for the second consecutive year. On clay, he won his third career title in Vina del Mar (d. L. Mayer), and clinched his career high at No.13 on March 31. He was also runner up in Buenos Aires (d. No. 17 Robredo in the semifinal, l. to Ferrer) and Munich (l. to Klizan), and lost a couple of semifinals in Stuttgart (l. to Bautista Agut) and Umag (l. to Cuevas). At Masters 1000 level, he celebrated his maiden quarter-final in Cincinnati (l. to Raonic). He reached the fourth-round at Australian Open (l. to Djokovic) in his best Grand Slam result of the season, and led Italy to their first Davis Cup semifinal since 1998, defeating Ward and No. 8 Murray in 3-2 defeat of Great Britain. 2016 - Fognini captured his fourth singles title in Umag (d. Martin) and and his fourth doubles title in Shenzhen w/Lindstedt (d. Marach/F. Martin). He defeated No. 1 Italian Lorenzi en route to Moscow final (l. to Carreño Busta in three sets) but lost to eventual champions in the semifinals in Munich (l. to Kohlschreiber) and the quarter-finals in Barcelona (l. to No. 5 Nadal). 2017 - The Italian captured his fifth ATP World Tour singles title, all on clay, in Gstaad (d. Hanfmann). At Masters 1000 level, he advanced to his second semifinal in Miami (d. Nishikori, l. to Nadal) and earned his biggest career win over No. 1 Murray in Rome in the second round (l. to A. Zverev in the third round). He saved 2 match points to beat Bautista Agut in St. Petersburg semifinal. He lost in the title-match to Dzumhur but 2017 became the sixth straight year with two or more finals. In his first match as a father, he beat Tiafoe in five sets at Roland Garros (l. to Wawrinka in the third-round).